The financial markets got off to a busy start in the first trading week of the new year. Markets saw economic reports for December. Manufacturing PMI’s released from the Eurozone, China, Japan, UK and the U.S. showed a broad uptick in the sector across the various economies and added to the positive risk appetite. In the Eurozone, there was good news as initial inflation estimates showed that the headline CPI in the Eurozone rose 1.1% in December, while core CPI rose 0.9%. Although the numbers are just initial estimates, the stronger than expected increase will no doubt be welcomed by policy makers from the ECB in hopes that inflation will continue to rose. Most of the gains in the headline inflation came from a nearly 2.5% increase in energy prices, so officials are likely to remain cautious on the outlook for inflation in the coming months. In the U.S. last week saw the payrolls report for December. The ADP payrolls showed that the U.S. economy 153k jobs during the month of December. However, November’s private payrolls was revised higher to 215k. Friday’s nonfarm payrolls report was once again a mixed bag with the U.S. economy adding just 156k jobs lower than the forecasts of 175k. However, previous month’s revisions showed an additional +19k jobs being added to the economy. At the same time, December’s wages showed a strong increase, rising 0.4% on a month over month basis or about 2.9% on a yearly basis marking one of the strong increase in wages. The unemployment rate in the U.S. rose to 4.7% from 4.6% as expected. 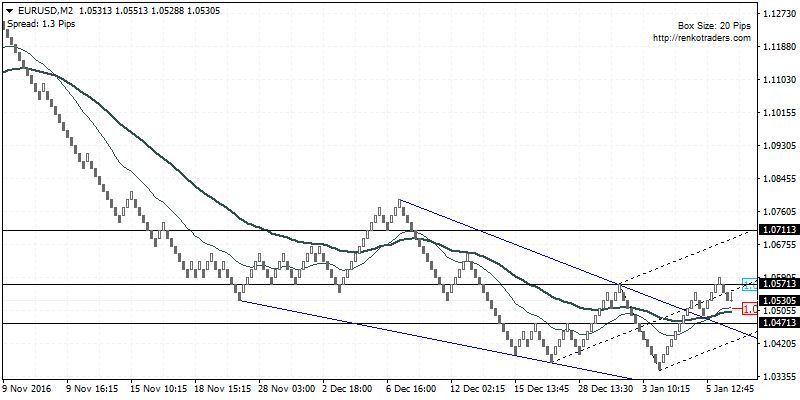 EURUSD: The 20 pip Renko chart for EURUSD shows price breaking out from the falling wedge pattern last week. The break out resulted in price rallying above 1.0571 before giving up some of the gains by Friday. This week, EURUSD is likely to extend the declines down to 1.0471 support level before a new bullish leg in the rally is renewed. Following a reversal at 1.0471, EURUSD could potentially be turning higher to test 1.07110 where resistance is likely to be established. The bullish view will be invalidated on a close below 1.0471. GBPUSD: The GBPUSD 20 pip Renko chart is showing signs of a potential retracement towards 1.2559 where resistance is likely to be established after price broke through this support previously. 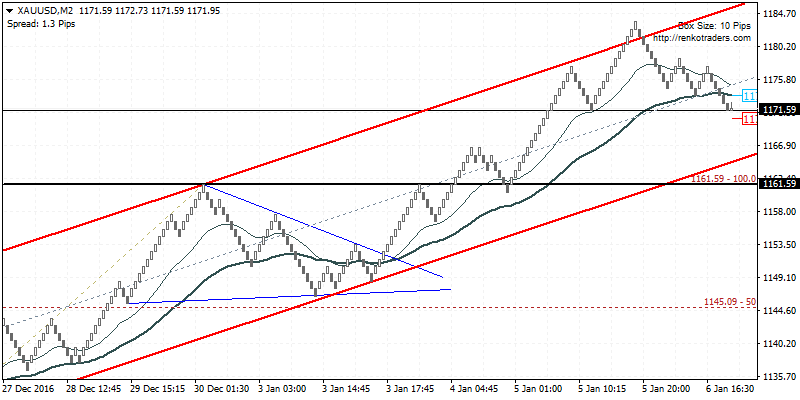 The median line on the chart shows the gradual downtrend in GBPUSD with signs of price bottoming out at 1.2219. The subsequent higher lows that are being formed gives early glimpses into a potential change of trend. However, price sits at a critical 1.2279 support level, which if breaks could see GBPUSD potentially extend the declines lower to 1.2219. On the other hand, a reversal near 1.2279 could potentially see GBPUSD attempt to rally to the upside, targeting 1.2559. XAUUSD: Gold prices are showing signs of exhaustion to the recent gains made but the pullback is likely to offer new buying opportunities. On the 10 pip Renko chart for gold, we see the bullish pennant pattern that was formed. This gives a minimum measured move to the upside towards 1194.59. However, gold prices gave up most of the gains are hitting the highs above 1183.60. Currently, the support at 1171.59 will be tested but in the event that price breaks below this level, further downside could see gold prices test 1161.59 support level which previously acted as resistance. A reversal off 1161.59 could signal further upside targeting 1171.59 followed by 1194.59. AUDUSD: The 20 pip Renko chart on AUDUSD shows that the bearish trend is likely to resume after last week’s modest retracement to 0.7326. The reversal near this level is seen with a hidden bearish divergence on chart which indicates further downside in the near term. 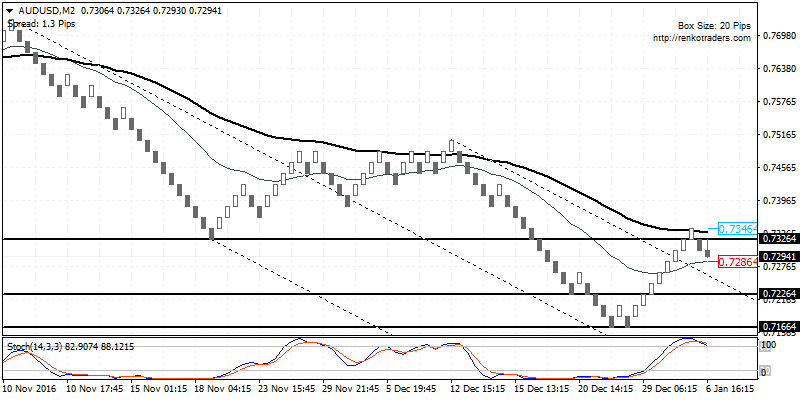 The initial target will be 0.7226 followed by the previous bottom that was formed at 0.7166. 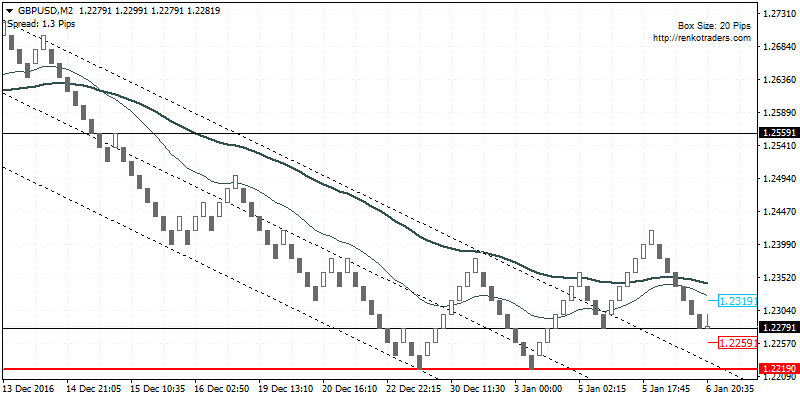 However, the declines could be limited to 0.7226, in which case AUDUSD could be turning bullish to target 0.7326 once again. Either ways, expect the bearish trend to continue below 0.7116 while a reversal at 0.7226 could signal a short term bullish rally. After a rather busy week, the markets look to the week ahead where most of the data is relegated to second-tier events unlikely to move the markets much. Still, there are some key events such as the first official press conference by President-elect Donald Trump who will be holding the event on Wednesday. Later on Thursday evening, Fed Chair Janet Yellen will be speaking as well. However, given the timing of the speech, which is late night, it is unlikely that the Fed chair will be speaking much on monetary policy. Following the December payrolls report, the expectations for a Fed rate hike remains strong in the first quarter of 2017. In Europe, data is limited to the ECB’s meeting minutes while in the UK there are rumors that the UK’s Supreme Court could be giving its verdict on whether the government must seek a parliamentary approval before triggering Article 50 or not. This could be a big event that could see a strong upside in GBPUSD if the verdict is as expected.